Lounge/dining room with sofa bed, 1-2-3 twin bedrooms, kitchenette, 1-2 bathrooms (bath + shower), fully equipped, furnished terrace or balcony. (Max: 7 people). Note: 1 bedroom apartments have 1 bathroom, 2 bedroom apartments have 1 or 2 bathrooms, 3 bedroom apartments have 2 bathrooms. There are 2 lake like salt-water swimming pools; one of which is heated from October to May. The large pool covers an area of 1,800 m2 and they both have spacious sun decks. There is a smaller pool especially for children. There is also a special area for children entertainment. A water park with two areas differentiated by age and two areas with state-of-the-art swings where there is no lack of fun. Right on the beach at Playa Las Americas. Lounge/dining room with sofa bed, 1-2-3 twin bedrooms, kitchenette, 1-2 bathrooms (bath + shower), fully equipped, furnished terrace or balcony (Max: 7 people). Note: 1 bedroom apartments have 1 bathroom, 2 bedroom apartments have 1 or 2 bathrooms, 3 bedroom apartments have 2 bathrooms. There are 2 lake salt-water swimming pools, one of which is heated from October to May. 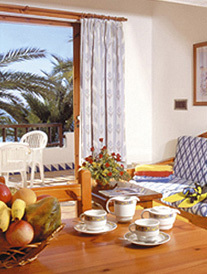 Location: Right on the beach at Playa Las Americas. Golf Tenerife- Gran Canaria offers reduced green fees on Buenavista Golf Club, Costa Adeje Golf Club, Amarilla Golf , Golf del Sur, Real Club de Golf de Tenerife and Las Americas Golf for all clients. 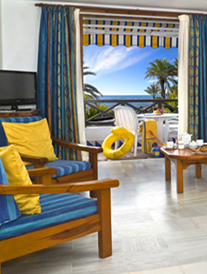 Parque Santiago III is a magnificent apartment complex, built in a modern Canarian style, ideally situated on the ocean front with direct access to the sea, on the golden corner of Playa de las Américas. The complex covers an area of 47,000 m2 and it is exactly located in one of the most recently developed areas of Playa de las Americas, at the promenade that leads to the nearby harbour of Los Cristianos. Parque Santiago IV is a magnificent apartment complex, built in a modern Canarian style, ideally situated on the ocean front and in one of the most recently developed and sunniest areas of Playa de las Americas. The complex covers an area of 20,000 m2, and it is exactly located on the golden corner of Playa de las Americas, at the promenade that leads to the nearby harbour of Los Cristianos.